This is going to be so much fun and so rewarding as well! I love, love, love people. I love meeting new people and getting to know them. I love becoming friends. Whether you have my same interests or not I want to get to know you. I started my blog about two years ago. I love all kinds of needle work ad just saw the blog as an extension of the arts that I love. Cross stitch is way up there on the list of my favorites, but I do also knit and crochet. I was born and raised in NH. A little city called Dover that has gone through so many changes over the years. I guess all cities have and fortunately, though most all of the big factories in Dover have closed down over the years, Dover continues to do well. I was raised with just one sister who lives in Dallas, Georgia today. Nine years ago, we left our home in NH and moved down here to NC. We never thought that we would leave NH. Never ever, but felt continued tugs from down here and started praying about God's will. We have one son who lives down here with his family. He's a gunny Sgt. in the Marine's and will be retiring in a couple of years now. We also have grandchildren and another son back in NH and Maine. After several months, we realized that God was making it quite obvious that He wanted us here. So after nine years, we can look back and see how he actually paved the road for us, and here we still are! Above you see me and my dear hubby, Bill. We're truly evenly yoked and we're so very blessed. On the right is my little daughter-in-law, Robin and my younger son Guy. Another picture of Mr. Bill and myself. This is Matthew. Our youngest grandson and Guy and Robin's son. He's showing off the popcorn he popped the "old fashion" way. He was pretty proud of that! No more pictures right now. I do have plenty more to show, but don't want to drive you all away! I also love to garden. Still getting used to growing down here in NC. Back in NH, any seed or plant that we put into the ground, grew and multiplied, but it has been a struggle down here for us, but we're still trying. I love working with the soil and often rescue plants that have been ignored in old abandoned house lots and all quite often. I need to let you all go right now. Please drop in from time to time so we can become friends. Let me know if you have any questions. Until next time, stay warm and safe. Once again. Last but not least. Remember to "feel the colors". Glad you decided to make NC your home. Nothing could be finer than to be in Carolina! That is what I think. We can't grow much here because of the squirrels! We have trapped a lot and relocated them and I think they find their way back here. Matthew does look mighty proud of his popcorn. I hope you and yours are having a great New Year. Hi Marie! So glad you stopped in to visit. If it weren't for "Grow Your Blog", we may not have ever met. I'm your newest follower and I really enjoyed my visit. What beautiful things you make. Welcome to my blog my new friend. Hi Linda, I enjoyed reading your post and getting to know you better. Love the pictures of you and your hubby,and family. Thank you so much for becoming a new follower. I've been a follower of yours for a while, but need to stop in and visit far more often! Love your sampler you're working up for Miss Abigail. If he gets stationed at Cherry Point Natasha, you need to tell him that he's welcomed at our house for dinner anytime. Thank him also for his service to keep us free. Very nice post Linda lee!! I love meeting new people in blog land too!! Lovely post!! Happy hopping!! I was over to your blog Sandra and I see you and I both share the love of color. Beautiful quilts you make. The blog party has been fun. Thanks for sharing your life with us! I know you stop in for a visit every so often Calamity, but cannot find your blog! I would love to pay you a visit. Could you send me your blog address? Thank you so much. Nice blog I like what I see and will be back. Glad I found you on the GYB travels this weekend. I believe MarchAnn that I'm your newest follower. Thank you for stopping in. So glad you listened to the direction of the Lord. He will never lead you where He is not already there! Blessings, and many thanks to your son for his commitment to my freedom. As a former military wife, blessing to Robin as well. Thank you so very much Robyn. What a nice comment, and we did indeed pray for months on the move down here. We knew that if it were not God's will, we wouldn't be happy here. It still amazes me every time I think about the signs He sent us. Robin has indeed been a great wife for Guy. Has always supported him. I joined your blog as well Huesei. What beautiful quilts you make. They're so perfect and you certainly have an eye for color. Welcome aboard new friend! Your stitching is lovely and that popcorn looks delicious! Hi Meg! So glad you stopped in. Thank you for the comment. I see you decided to be a new follower. Thank you so much and I'm looking forward to a new friendship. Heading over to your blog right now girlfriend. It is so nice to meet you. Your blog is lovely. I'm still making my way through visiting everyone from Vicki's Grow Your Blog party. I hope you will stop by to say hello. And it's nice to meet you as well Donna. I'll be over to visit for sure. Thank you for stopping in. Hello Miss LindaLee, and thank you for your comment on Comptonia :) I love your pictures of flowering shrubs in January. I'm in MA and it's 2 degrees F right now. You asked about a simple sock pattern...I don't actually use a pattern for plain "vanilla" socks, but are you on ravelry.com? It's free to join. It's a wonderful resource for knit and crochet patterns, hundreds (maybe thousands!) of them for free. And you can usually see many examples of a pattern, knit with lots of different yarns. Very helpful! please tell your military folks, THANKS for serving! visiting via Vicki's GYB Party and enjoying your crochet...lovely! Will do. I thank many of them often, since we live in a military town. So many men and women to be proud of. God bless America and all those who keep it free. Hi Linda...I'm already a follower of your blog but wanted to say hi from the party! I tried to find a blog for you Lynda but couldn't. Please let me know if you do have one and what the name of it is, so I can return your visit. I know you have indeed been one of my followers for quite a while. Thank you for stopping in once again. Hi Miss Linda lee, I'm visiting via Vicki's gybp event. I've enjoyed looking around your blog and seeing your crafty projects. Its been nice getting to know a bit about you and your blogging adventures. Hi Karen. I thank you so much for stopping in to visit, and of course I jumped right on over to your blog and love it there. What beautiful knitting you do, and I love to knit as well. I'm a new follower of yours. 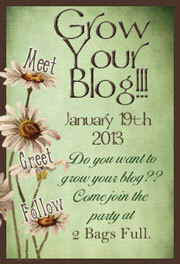 Isn't this "Grow Your Blog" party fantastic. You have a wonderful weekend. I have become a follower and look forward to visiting often. Hi Denise! Was just over visiting with you and I love your blog. 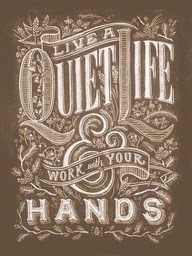 What beautiful work you do! I just became follower 105! Looking forward to a new friendship! It is so nice to meet another stitcher. I look forward to stopping by again. Hello Angela! I just came back from your blog and am your newest follower at this point. You take it easy packing and getting ready for your move and all. Don't forget to get lots of rest. Where are you moving to? Glad you came by and please come back and visit soon. It is lovely to meet you and your family and to see your photos. I am still working my way through the blogs on the list, so many of them.